Intel’s 8th Generation Core processor, code named Coffee Lake, is living up to the hype. The gaming performance and clock speed potential of the Intel Coffee Lake “K” series is unprecedented. Some of you (those lucky enough to get your hands on a CPU) may still be wondering which motherboard should you consider putting your Coffee Lake beast into? We submit for your review, the ASUS Maximus X Hero. 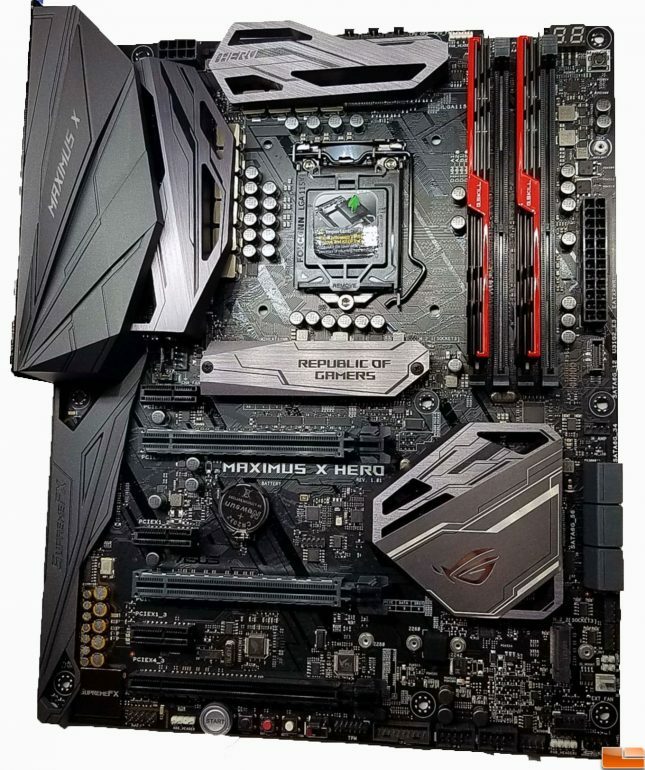 The ASUS Maximus X Hero comes in near the top of the ASUS Z370 chipset lineup, priced at $259.99 shipped. The ASUS Maximus X Hero is said to be the “sweet spot” for gamers and overclockers as it should have all the features you need and doesn’t have 802.11ac wireless. If you need an Intel Z370 board with Wi-Fi you’ll need to spend an extra $20 and get the ASUS ROG MAXIMUS X Hero (WI-FI AC) version that costs $279.99 shipped. Going above this price gets into the yet to be released ASUS Maximus X Code and ASUS Maximus X Formula. The X Formula adds watercooled VRM heatsinks, larger PCH heatsink, and black “armor” that covers the board to help resist heat. Sitting at the top of ASUS product stack is the aptly named ASUS Maximus X Apex. It is aimed squarely at overclockers and is priced at $349.99. Going down the stack from the X Hero, we have the ASUS ROG STRIX Z370-E Gaming which takes away the ESS Sabre DAC and some of the thermal sensor headers for a price of $209.99, including AC/Wifi. The ASUS ROG STRIX Z370-F drops the Wifi module and one of the two USB 3.1 controllers for $194.99. Below this price point is the ROG microATX and Mini-ITX offerings where the form factor begins to really determine the amount of features equipped. Also below $194.99 are the ASUS Prime series of motherboards, which are great motherboards, but make some feature changes in order to appeal to more price conscious consumers. After wearing out the F5 button on our keyboard for the last several weeks, we are happy to say that our testing is with a retail sample of the Intel Core i7-8700K acquired from Microcenter. The ASUS Maximus X Hero is of course based on Intel’s Z370 chipset, the only current LGA 1151 socket supporting Coffee Lake processers. It is an ATX design with a plethora of features, sure to please many. Below are the specifications and a list of features, which we will detail in the pages that follow. Let’s take a look at the board layout!